A major figure in 20th century arts and music (& beyond), Philip Corner studied with Henry Cowell and Olivier Messiaen, and was one of the original Fluxus conspirators, among other highlights of his long and storied career. 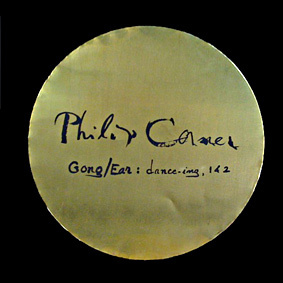 As part of the body of his “Metal Meditations” work, “Gong / Ear” is a decades-long series of improvisations with dancers. Utilizing his favorite Paiste tam-tam, these two recordings from Corner’s NYC Leonard Street loft in 1989 are a feedback loop of perceptions between gong and dance: “the initiating sound (or is it the dancer’s posture?) is made physically audible. Responsive movement is turned back into sound. Musicianly attentiveness sends it back and it continues.” Gong / Ear : dance-ing, 1 & 2 is released in a limited edition of 305 copies, each with a handcut facsimile brass gong, silkscreened with Corner’s calligraphy and mounted onto the jacket. Download coupon included. “Recorded at his New York City loft on two separate dates in April 1989, Gong/Ear: Dance-ing, 1 & 2 forms part of Corner’s continuing metallic meditations exploring the reverberating qualities of bells and other metal objects. Unfolding over many decades, the Gong/Ear series explores the spontaneous feedback between a gong player and a dancer, interacting with each other as they perform together. “Responsive movement is turned back into sound,” he notes of these sessions. “Musicianly attentiveness sends it back and it continues.” The two performances preserved here, one with Claude Cossette and the other with Elisabeth Vittori, convey with direct simplicity the physical intensity of the sounds produced. Corner’s favourite Paiste tam-tam becomes a sounding board for the entire room: the natural timbre of the instrument is intensified not only by the often vigorous tempi with which he keeps pace with the individual dancers but also by the unpredictable distortions produced as the recording device becomes overloaded by the extreme volume levels produced. These, as Corner specifies in the short sleevenotes to this LP, “are inherent and desired”. The tape machine becomes in effect a third participant in the performance: everything it picks up is accepted as part of the finished piece. There is a wonderful moment near the start of the Vittori session when a telephone rings somewhere in the room, the metallic chimes of its bell contrasting neatly with the resonant swell of the gong; rather than stop the recording and start again, Corner briefly answers the call, barely missing a beat before he continues playing.